ABSTRACT. Interleukin-1 (IL-1) is a pleiotropic proinflammatory cytokine with two distinct isoforms (IL-1α and IL-1β) that signal through the same IL-1 type I receptor (IL-1RI). Contributions of IL-1β have been demonstrated in human and experimental proliferative glomerulonephritis (GN), but the involvement of IL-1α has received little attention. To determine the combined contribution of IL-1α and IL-1β and to dissect the specific contribution of IL-1β, the development of anti-glomerular basement membrane globulin–induced crescentic GN was studied in mice genetically deficient in either the IL-1 receptor type I (IL-1RI−/−), which are unresponsive to both IL-1α and IL-1β, or IL-1β alone (IL-1β−/−). IL-1β−/− mice showed significant reductions in crescent formation and glomerular T cell and macrophage recruitment compared with strain matched controls (WT). No additional reductions of these indices of injury were observed in IL-1RI−/− mice. However, IL-1RI−/− mice showed greater functional renal protection with significantly less proteinuria and reduced serum creatinine compared with IL-1β−/− mice, suggesting a significant contribution of IL-1α to these parameters of injury. 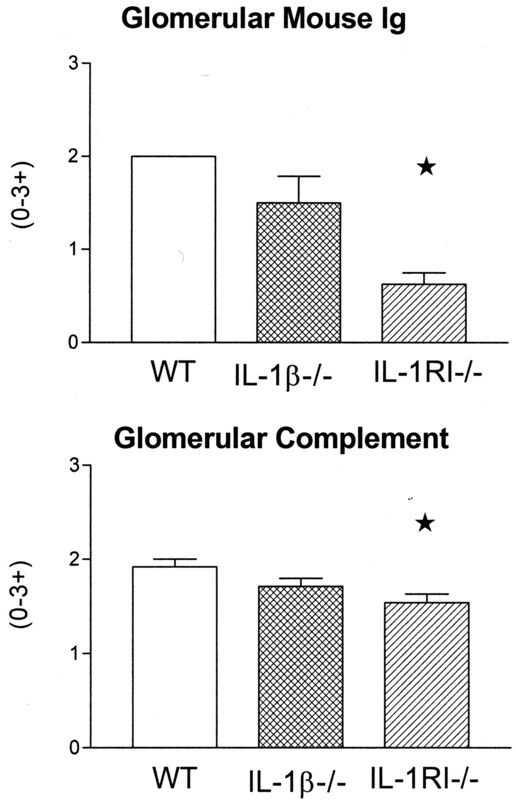 IL-1RI−/− mice had lower serum titers of antibody to the nephritogenic antigen (sheep globulin) and reduced glomerular deposition of complement compared with either IL-1β−/− or WT mice. This suggests that in the absence of responses to both IL-1α and IL-1β, attenuation of humoral mediators provides additional functional protection from renal injury that is not seen in the absence of IL-1β alone. These studies indicate that IL-1β but not IL-1α contributes to crescent formation and inflammatory cell recruitment, whereas IL-1α but not IL-1β contributes to humoral mechanisms of glomerular injury. Interleukin-1 (IL-1) is a pleiotropic cytokine with important roles in innate and adaptive immunity. IL-1 has two biologically active isoforms, IL-1α and IL-1β, which are products of separate genes and have approximately 27% amino acid sequence homology. These two isoforms have similar but not identical biologic effects and act through the same surface receptors (1,2⇓). IL-1α is mainly cell membrane–associated and is produced in large amounts by keratinocytes. IL-1β acts mainly as a secreted molecule and is produced principally by monocytes and macrophages. Other sources of IL-1β include neutrophils, lymphocytes, fibroblasts, smooth muscle cells, endothelial cells, and intrinsic renal cells (3,4⇓), including glomerular endothelial cells, mesangial cells, and tubular epithelial cells. Two receptors for IL-1 have been identified; however, only the type I IL-1 receptor (IL-1RI) or CD121a transduces a signal upon IL-1 binding. Therefore most cellular responses to IL-1 are mediated through the IL-1RI, which is widely expressed on a variety of tissues, including lymphocytes (5–8⇓⇓⇓). Expression of the type II IL-1 receptor (IL-1RII) or CD121b is limited to blood neutrophils, monocytes, bone marrow progenitor cells, and B lymphocytes (9). As the IL-1RII receptor does not transduce a signal following ligation, it acts as a decoy receptor and may play a regulatory role in IL-1 responses (5,6,10⇓⇓). IL-1 has important roles in inflammatory responses by stimulating T cells and B cells and activating macrophages and natural killer cells. IL-1 induces its own synthesis as well as inducing synthesis of other inflammatory mediators including TNF, IL-8, IL-6, nitric oxide, and prostaglandin-E by monocytes (11–13⇓⇓). In BALB/c mice, IL-1α stimulates IL-12–dependent Th1 differentiation of CD4+ T cells after antigen presentation by dendritic cells (14). IL-1α activates nuclear factor–κB and stimulates proliferation of Th2 cells but not of Th1 cells (15). In C3H/HeJ mice, IL-1β shows greater stimulatory activity of T cell–dependent and –independent antigen responses than IL-1α (16). IL-1 has been implicated in a number of inflammatory disease states, such as local and systemic infection, rheumatoid arthritis (17,18⇓), septic shock (19), and autoimmune diseases, such as lupus nephritis (20) and vasculitis inflammatory bowel disease (21). Glomerular expression of IL-1β has been demonstrated in proliferative forms of human glomerulonephritis (GN) (3,22⇓) and in antineutrophil cytoplasmic antibodies (ANCA)–associated crescentic GN (23). Treatment with IL-1 receptor antagonist (IL-1ra) has indirectly demonstrated an important role for IL-1 in experimental crescentic anti-glomerular basement membrane (GBM) GN in rats, although this treatment does not distinguish the separate contributions of IL-1α and IL-1β. IL-1ra has also been shown to attenuate acute heterologous anti-GBM antibody induced glomerular injury in rats (24). The individual contributions of IL-1α and IL-1β to crescentic GN have not been studied, although some studies have addressed their contributions to acute heterologous anti-GBM antibody induced injury. In rat nephrotoxic nephritis, administration of IL-1β increases heterologous proteinuria (25), whereas pretreatment with anti-IL-1β antibodies but not anti-IL-1α antibodies attenuated heterologous phase proteinuria and neutrophil recruitment in anti-GBM injury augmented by endotoxin (26). The present study investigated the contributions of IL-1α and IL-1β to development of crescentic GN, using a Th1-dependent cell-mediated murine model in IL-1β- and IL-1RI–deficient mice. It provides evidence for separate contributions of these two isoforms of IL-1, demonstrating involvement of IL-1β in Th1-dependent crescent formation and recruitment of cellular effectors and suggesting that IL-1α may contribute to antibody and complement-mediated proteinuria. Mice homozygous for targeted deletions of IL-1β (27) and IL-1RI (28) genes backcrossed onto a C57BL/6 background were bred and housed under specific pathogen-free conditions at Monash University (Clayton, Victoria, Australia). Twenty-four C57BL/6 (WT) controls, 11 IL-1β−/−, and 9 IL-1RI−/− male mice weighing 20 to 26 g and aged between 13- and 14-wk-old were used. Crescentic GN was initiated by an intravenous injection of a total of 14.4 mg of sheep anti-mouse GBM globulin, given as two equally divided doses 3 h apart, as described previously (29,30⇓). Twenty days later, mice were placed individually in metabolic cages to collect urine over the final 24 h of the experiment. Twenty-four hours later (day 21), mice were anesthetized by inhalation of methoxyflurane, bled by cardiac puncture, and killed to collect kidney and splenic tissue. Glomerular crescent formation was assessed in periodic acid-Schiff reagent (PAS)–stained 3-μm sections cut from kidney tissue that was fixed in Bouin fixative and embedded in paraffin. Glomeruli were considered to exhibit crescent formation when two or more layers of cells were observed in Bowman’s space. A minimum of 50 glomeruli was assessed to determine the crescent score for each animal. Glomerular CD4+ T cell and macrophage accumulation was assessed in kidney and spleen tissue that was fixed in periodate/lysine/paraformaldehyde (PLP) for 4 h, washed in 7% sucrose, and then frozen in liquid nitrogen. Six-micrometer cryostat cut sections were stained to demonstrate CD4+ T cells and macrophages with monoclonal antibodies (GK1.5 and M1/70, respectively) using a three-layer immunoperoxidase technique (31). A minimum of 20 equatorially sectioned glomeruli were assessed per animal, and were results expressed as cells per glomerular cross section (c/gcs). Glomerular deposition of sheep globulin, mouse Ig, and complement was detected by direct immunofluorescence on 6-μm cryostat cut sections from five animals from each experimental group. Glomerular deposition of sheep IgG was assessed by determining the end point titer on sections stained with FITC-conjugated rabbit anti-sheep IgG antibody (Silenus, Melbourne, Australia) in serial doubling dilutions from 1:200 to 1:3200. The highest dilution of detecting antibody at which staining above background levels could be detected was taken as the end point titer for each animal. Glomerular mouse Ig was quantified using a FITC-conjugated sheep anti-mouse Ig (Silenus). Sections were stained at a range of dilutions from 1:100 to 1:1,600 to find a titer in which deposition of mouse Ig was detectable in all groups (1 in 800). Representative sections from five animals per group were then stained at 1:800, and glomerular mouse Ig was scored 0 to 3+ in a blinded protocol. Glomerular complement deposition was detected using FITC-conjugated goat anti-mouse C3 (Cappel, Durham, NC) antibody at a dilution of 1:100. In a blinded protocol, a minimum of 50 glomeruli per mouse were scored semiquantitatively (0 to 3+), with 0 being equivalent to background and 3+ equal to the most intense fluorescence in any glomerulus. Proteinuria was determined from urine before administration of anti-GBM globulin and over the final 24 h of the experiment. Urinary protein concentrations were determined by a modified Bradford method. The 24-h urinary protein excretion rate was calculated from the 24-h urine volume and the urinary protein concentration. Before induction of GN, all groups of mice had 24-h urine protein excretion in the normal range (0.5 to 2.0 mg/24 h). Serum creatinine concentrations were measured by an enzymatic creatininase assay. Concentrations of urinary nitrite plus nitrate were determined in a Griess assay. Urine samples were centrifuged at 2000 g for 10 min at 4°C, and 50-μl aliquots were added to 50 μl of Griess reagent (1.5% sulfanilamide/0.15% naphthyl ethylene diamine) in a 96-well microtiter plate. The plate was incubated for 10 min at room temperature, and the absorbance was read on a microplate reader at 530 nm. The samples were run in duplicate, and the concentration of nitrite was calculated by comparison with absorbance values NaNO2 standards of known concentration, and results are expressed as mg/ml. Cutaneous delayed-type hypersensitivity (DTH) to subdermal sheep globulin challenge was determined in mice developing GN over the final 24 h of the experimental protocol. Mice were challenged with a subdermal injection of 500 μg of sheep globulin in 50 μl of PBS into one hind footpad. A similar dose of an irrelevant antigen (horse globulin) was injected into the other footpad as a control. Measurements of footpad swelling were quantified 24 h later using a micrometer (Mitutoyo Corporation, Kawasaki, Japan). Antigen-specific DTH was taken as the difference in skin swelling between sheep globulin– and horse globulin–injected footpads and expressed as Δ footpad thickness (mm). Total anti-sheep globulin Ig and anti-sheep globulin IgG1 and IgG2a isotypes were measured by ELISA on serum collected at the end of the experiment. Assays were performed using microtiter plates coated with sheep globulin at a concentration of 10 μg/ml. Plates were washed and blocked with 1%BSA in PBS for total Ig and IgG1 assays, or with 2% casein in PBS for the IgG2a assay. Plates were then washed and incubated with a 1:800 dilution of serum for 1 h at room temperature (or overnight at 4°C in the case of the IgG2a assay). Bound mouse Ig was detected using horseradish peroxidase (HRP)–conjugated sheep anti-mouse Ig (Amersham, Little Chalfont, UK) for total Ig and goat anti-mouse IgG1 or IgG2a, (Southern Biotechnology Assoc, Birmingham, AL) for IgG subclasses. 3,3′5,5′ tetramethyl-benzidine (TMB; Sigma Aldrich Pty Ltd, NSW, Australia) was added as a chromogenic substrate, and the absorbance was read at 450 nm, as described previously (32). Serum, kidney, and brain tissue samples were collected from normal WT (n = 3) and IL-1β−/− (n = 3) mice and WT (n = 5) and IL-1β−/− (n = 5) mice with GN. Kidney and brain samples were homogenized in 0.1 M NaCl, 0.05 M TrisCl, 2% vol/vol Triton X-100 together with protease inhibitors (Roche Diagnostics, Melbourne, Australia). The homogenate was spun at 14000 rpm for 15 min, and the supernatant was collected. Tissue extracts and serum were stored at −70° until assayed. IL-1α was measured by ELISA, with a detection limit of 0.03125 ng/ml. Microtiter plates were coated with anti-mouse IL-1α antibody as the capture Ab (R&D Systems, NSW, Australia) at a concentration of 3 μg/ml. Plates were washed in 0.05% Tween/PBS and blocked with 1%BSA in PBS for 2 h at 37°C. Plates were then washed and incubated with recombinant murine IL-1α (R&D Systems) at serial dilutions between 2.0 and 0.0625 ng/ml dilutions or with serum, brain, and kidney extracts at 4°C overnight. Plates were washed, and bound mouse IL-1α was detected using biotinylated anti-mouse IL-1α Ab (R&D Systems) at a concentration of 200 ng/ml for 1 h at room temperature. Plates were washed; streptavidin-HRP (Chemicon, Melbourne, Australia; 1:2000 in 1% BSA/PBS) for 20 min at room temperature followed by TMB (Sigma Aldrich Pty Ltd) was used as a chromogenic substrate. All samples were assayed in duplicate, and results were calculated as IL-1α ng/g wet weight or ng/ml for serum. Results are expressed as the mean ± SEM. The statistical significance was determined by one-way ANOVA, followed by Newman-Keuls post hoc test. Crescentic GN in this murine model has been well characterized as a CD4+ Th1-dependent model (33–36⇓⇓⇓). It demonstrates features similar to human crescentic GN with crescent formation, glomerular accumulation of T cells, and macrophages with severe impairment of renal function. In the current study, WT mice developed severe proliferative GN (Figure 1A) with prominent crescent formation (25.1 ± 1.7% of glomeruli) and glomerular accumulation of CD4+ T cells (1.12 ± 0.09 c/gcs) and macrophages (2.12 ± 0.15 c/gcs) (Figure 2). Functional renal injury in WT mice was indicated by proteinuria (9.1 ± 1.0 mg/24 h; normal <2.0 mg/24h) elevated serum creatinine (25.2 ± 2.0 μmol/L; normal 9.8 ± 1.2 μmol/L) and increased urinary nitric oxide production (9.5 ± 1.6 mg/ml; normal 0.26 ± 0.03 mg/ml), which is a product of activated macrophages (Figure 3). Figure 1. Twenty-one days after the administration of anti-glomerular basement membrane (GBM) globulin, the histologic appearance of crescentic glomeruli in WT with severe proliferative glomerulonephritis (GN) (A), with increased interstitial infiltrate and glomerular deposition of periodic acid-Schiff (PAS)–positive material. In contrast, IL-1β−/− (B) and IL-1RI−/− (C) mice have mild histologic changes 21 d after anti-GBM globulin, crescentic glomeruli are occasional, and interstitial infiltrate is reduced. 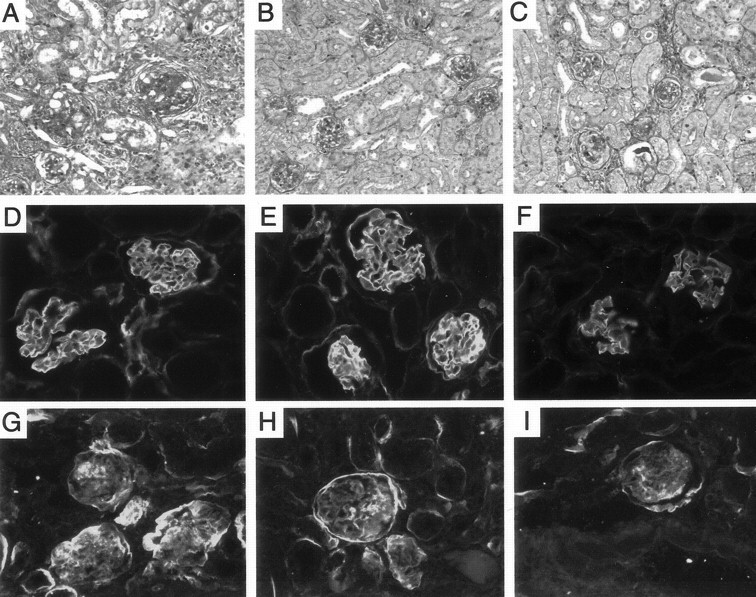 Immunofluorescence demonstrating glomerular mouse Ig deposition in WT (D), IL-1β−/− (E), and IL-1RI−/− (F) animals with GN. Intense glomerular staining was observed for WT and IL-1β−/− mice; however, IL-1RI−/− mice had significantly decreased glomerular deposition of mouse Ig. This observation correlates with glomerular complement deposition; similar to the glomerular mouse Ig pattern, observed WT (G) and IL-1β−/− (H) mice had intense immunofluorescence in glomeruli, with tubular C3 deposition also apparent, whereas IL-1RI−/− mice had a reduced level of C3 (I). A–C, PAS-stained sections, original magnification, ×200; D–I, immunofluorescence, original magnification, ×400). Figure 2. Histologic changes observed in crescentic GN, specifically the incidence of crescent formation (% glomeruli affected), glomerular infiltration of CD4+ T cells, and macrophages (cells/glomerular cross section [c/gcs]) in WT, IL-1β−/−, and IL-1RI−/− mice with crescentic GN. ★ indicates P < 0.05 compared with WT mice. Figure 3. Functional renal indices of injury. Proteinuria (mg/24 h), serum creatinine (μmol/L), and urinary nitric oxide levels (mg/ml) in WT, IL-1β−/−, and IL-1RI−/− mice with crescentic GN. ★ indicates P < 0.05 compared with WT mice. ★★ indicates P < 0.05 compared with IL-1β−/− mice. The broken line indicates the urinary protein excretion, serum creatinine, and urinary nitric oxide in normal WT mice. Significant protection from development of crescentic GN was observed in IL-1β−/− mice. Glomerular crescent formation (15.3 ± 2.2% of glomeruli in IL-β−/−; P < 0.01 versus WT) was reduced, as was glomerular infiltration of CD4+ T cells (0.29 ± 0.04 c/gcs; P < 0.001 versus WT) and macrophages (0.42 ± 0.27 c/gcs; P < 0.001 versus WT) (Figure 2). Reduction in the histologic injury (Figure 1B) corresponded with significant protection of renal function, indicated by reduction in proteinuria (6.3 ± 0.9 mg/24 h; P < 0.05 versus WT) and urinary nitric oxide (4.5 ± 0.3 mg/ml; P < 0.05 versus WT). The reduction in serum creatinine (20.6 ± 0.8 μmol/L) was not statistically significant (P = 0.12) compared with WT mice (Figure 3). Previous reports suggest that IL-1α levels in the brain following turpentine treatment and macrophage IL-1α production following LPS stimulation are significantly attenuated in IL-1β–deficient mice (27,37⇓). To address the possibility that decreased renal IL-1α levels may contribute to the protection against anti-GBM GN in IL-1β−/− mice, we measured renal, serum, and brain IL-1α levels in IL-1β–deficient mice before and after induction of GN. IL-1α in the kidney and brain from normal WT and IL-1β−/− mice were equivalent. Serum IL-1α levels were below the level of detection of the assay. Following induction of GN, IL-1α in the kidney or brain remained equivalent in WT and IL-1β−/− mice and serum levels were still undetectable. Although there was a trend to an increase in IL-1α in the kidneys of IL-1β−/− mice following induction of GN, this was not statistically significant (Figure 4). Figure 4. IL-1α levels were measured in brain and kidney by ELISA in WT and IL-1β−/− mice with and without GN. Tissue samples were homogenized and protein extracted, results expressed as concentration (ng) over tissue wet weight (g). No significant differences were observed in IL-1β−/− compared with WT mice in any of the tissues examined. IL-1RI–deficient mice were used to determine the combined contribution IL-1β and IL-1α to crescentic GN. Histologically, IL-1RI−/− mice show similar protection to IL-1β−/− mice (Figure 1C) with regard to their development of crescents (14.0 ± 1.7% of glomeruli in IL-1RI−/−; P < 0.05 versus WT) and glomerular accumulation of CD4+ T cells (0.28 ± 0.03 c/gcs; P < 0.001 versus WT) and macrophages (0.33 ± 0.12 c/gcs; P < 0.001 versus WT) (Figure 2). However, IL-1RI−/− mice demonstrated additional preservation of renal function in comparison to IL-1β−/− mice, indicated by significantly less proteinuria (2.8 ± 1.4 mg/h; P < 0.01 versus IL-1β−/−) and serum creatinine (16.0 ± 1.4 μmol/L; P < 0.05 versus IL-1β−/−). Urinary nitric oxide levels in IL-1RI−/− mice (4.5 ± 0.4 mg/ml; P < 0.05 versus WT) were also reduced compared with WT mice (Figure 3) but were not different from IL-1β−/− mice, paralleling the patterns of glomerular macrophage accumulation. Circulating titers of mouse anti-sheep globulin antibodies were measured as an index of systemic humoral immune responses to sheep globulin. 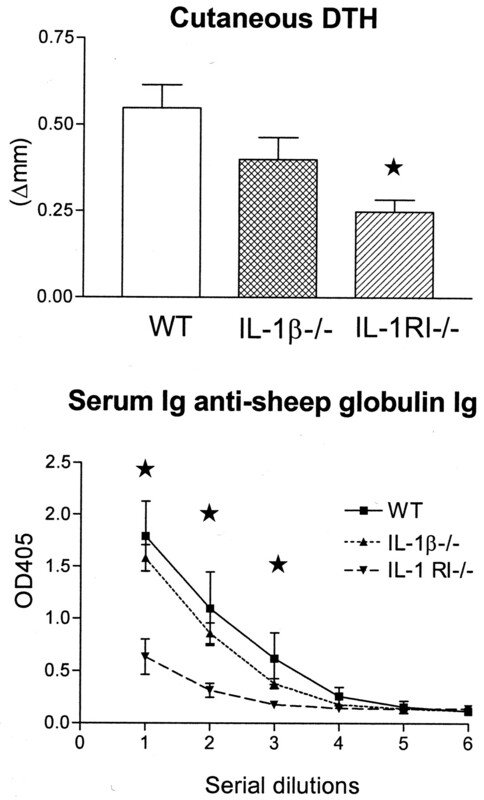 Total anti-sheep globulin Ig was unaffected in IL-1β−/− but was significantly reduced in IL-1RI−/− mice compared with WT controls (Figure 5). Analysis of mouse anti-sheep globulin IgG subclasses showed increased IgG1 (Th2-dependent) and reduced IgG2a (Th1-dependent) isotypes in IL-1β−/− mice (IgG1, 2.45 ± 0.14; IgG2a, 0.76 ± 0.13) with an IgG1/IgG2a ratio of 3.22 compared with a ratio of 0.40 in WT mice (IgG1, 0.73 ± 0.09; IgG2a, 1.81 ± 0.32) with GN, suggesting deviation of immune response to sheep globulin from Th1 to Th2 in the absence of IL-1β. IL-1RI–deficient mice showed higher levels of both IgG1 (2.82 ± 0.09) and IgG2a (3.27 ± 0.03) IgG subclasses; however, their ratio was (0.68) similar to WT mice. Figure 5. (Top panel) Cutaneous DTH responses to sheep globulin in WT, IL-1β−/−, and IL-1RI−/− mice with GN (21 d after intravenous sheep globulin). ★ indicates P < 0.05 compared with WT mice. (Bottom panel) Serum titers of mouse anti-sheep globulin Ig in WT (▪), IL-1β−/− (▴), and IL-1RI−/− (•) mice developing crescentic GN (n = 5). ★ indicates Ig titers significantly reduced (P < 0.05) compared with WT mice and IL-1β−/− mice. Linear glomerular deposition of sheep Ig was the same in all groups, with a mean end point titer of 1 in 1600, indicating equivalent glomerular deposition of the nephritogenic antigen. Glomerular deposition of mouse Ig was similar in WT (Figure 1D) and IL-1β−/− mice (Figure 1E) (mean score at 1:800 dilution: 2.00 ± 0.0 and 1.5 ± 0.28, respectively). 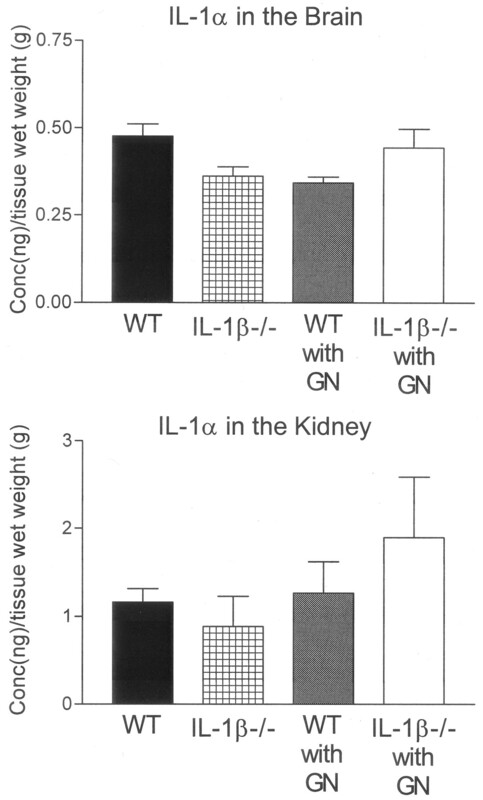 In IL-1RI−/− (Figure 1F), glomerular mouse Ig was significantly reduced (mean score at 1:800 dilution 0.63 ± 0.13; P < 0.01 versus WT and IL-1β−/− mice; Figure 6). Glomerular deposition of C3 was unaffected in IL-1β−/− mice (Figure 1H; 1.71 ± 0.09) compared with WT mice (Figure 1G; 1.92 ± 0.08), but it was significantly reduced in IL-1RI−/− mice (Figure 1I; 1.54 ± 0.09; P < 0.01 versus WT; Figure 6), corresponding to the reduced circulating mouse anti-sheep globulin antibody titers. Figure 6. Deposition of mouse Ig and C3 in glomeruli of WT, IL-1β−/−, and IL-1RI−/− mice developing crescentic GN (n = 5). ★ indicates P < 0.05 compared with WT mice. Mice given sheep globulin demonstrated antigen-specific skin swelling after cutaneous challenge with sheep globulin. Cutaneous DTH responses were equivalent in WT (0.55 ± 0.07 mm) mice and IL-1β−/− (0.40 ± 0.05 mm) mice. Cutaneous DTH responses to sheep globulin were reduced by approximately 55% in IL-1RI−/− mice (0.25 ± 0.04 mm; P < 0.01 versus WT). In the present study, we have used IL-1β−/− and IL-1R−/− mice to investigate the specific roles IL-1β and IL-1α have in the development of crescentic GN. Few studies have demonstrated distinct roles for IL-1β and IL-1α in the pathogenesis of inflammatory diseases. Studies have suggested a role for IL-1β in the initiation and progression of collagen-induced arthritis and in contact hypersensitivity responses, but data are limited on the role of IL-1α in inflammation. These studies provide the first demonstration of an important role for IL-1β in the development of crescentic GN. IL-1β–deficient mice have intact humoral immune responses to the planted nephritogenic antigen (sheep globulin), but glomerular recruitment of cellular immune effectors (T cells and macrophages) was significantly reduced. Urinary nitrite production, an index of macrophage-derived nitric oxide–mediated injury was also reduced. As a result, they have diminished crescent formation and functional renal injury. Analysis of IgG isotypes revealed a reduction in Th1-dependent subclasses but an increase in Th2-dependent subclasses, suggesting that the effects IL-1β on the outcome of this disease may be partly dependent on its ability to augment Th1-dependent cell-mediated immunity. Previous studies have suggested that IL-1β–deficient mice have reduced IL-1α production in the brain following turpentine challenge and impaired ex vivo IL-1α production by LPS-stimulated macrophages (27). An in vivo study of endotoxin responses in IL-1β–deficient mice showed that their serum IL-1α levels were equivalent to WT mice (37). In vitro, their IL-1α production by LPS-stimulated peritoneal macrophages was reduced (37). In another study, LPS stimulated peritoneal exudate cells from IL-1β−/− and WT mice when treated with ATP demonstrate indistinguishable IL-1α production (38). In our model of anti-GBM GN, renal IL-1α levels were unaltered by IL-1β deficiency, both before and after induction of GN. Brain levels were also unaffected. This discrepancy in IL-1α dependence on IL-1β may be attributed to the different types of inflammatory mechanisms in the different models studied. As different mediators of inflammation are involved in each response, the different degree of involvement of cytokines (e.g., IFN-γ) may be responsible for different IL-1α responses. In IL-1RI–deficient mice that are unresponsive to both IL-1α and IL-1β, crescent formation and glomerular DTH effectors were reduced to a similar extent observed in IL-1β–deficient mice, suggesting no additional role for IL-1α in these manifestations of disease. However, a significant reduction in the humoral immune response indicated by decreased circulating antibody to sheep globulin was observed. This was associated with reduced glomerular complement and mouse anti-sheep Ig deposition and additional preservation of renal function indicated by proteinuria and serum creatinine compared with IL-1β–deficient mice. This is consistent with a role for IL-1α in development of humoral effector mechanisms that contribute to proteinuria but not to crescent formation in this model. A similar contribution of humoral immunity to anti-GBM induced GN was demonstrated using in μ chain–deficient mice. These mice, which have intact cellular immunity but fail to produce Ig, show no impairment in crescent formation and T cell and macrophage recruitment, but decreased serum creatinine and proteinuria in the absence of a humoral immune response (39). Evidence suggests that IL-1α and IL-1β have varying roles in the generation of antibody responses and development of cutaneous contact hypersensitivity. Their contributions vary with different haptens or antigens, the use of adjuvants, and possibly the mode of antigen presentation (40–42⇓⇓). In mice, IL-1β but not IL-1α is required for antibody responses to sheep red blood cells and 2,4,6-trinitrochlorobenzene when the immunization protocol does not involve adjuvant (42,43⇓). In murine collagen-induced arthritis, antibody responses to bovine type II collagen were not impaired in IL-1β–deficient mice (44). Both IL-1α and IL-1β contribute to allergen-specific Th2 cell activation and airway hypersensitivity induced by ovalbumin in BALB/c mice (45). IL-1β–deficient BALB/c mice show reduced Th2 antibody isotypes (both IgG1 and IgE), whereas in IL-1α–deficient BALB/c mice only IgE but not IgG1 is decreased, further illustrating the complexity of the contributions of IL-1β in humoral immune responses. In the present study, the nephritogenic antigen (sheep globulin) was administered intravenously without adjuvant. Although IL-1β deficiency did not alter the levels of circulating anti-sheep globulin mouse Ig, IgG2a (Th1 dependent) antibodies were reduced and IgG1 (Th2) were increased suggesting bias toward Th2 compared to WT mice. Reduction in recruitment of DTH effectors (macrophages and T cells) and glomerular crescent formation is consistent with Th1 dependence of these manifestations of disease. The lack of attenuation of DTH to the same antigen following cutaneous challenge is consistent with the observation that IL-1α from dermal cells plays a dominant role in facilitating antigen presentation to sensitized T cells at that site (43). T cell dependent antibody production is impaired in combined IL-1α/β deficient mice and is associated with impaired antigen presenting cell stimulated of CD40 ligand and OX40 expression on CD4+ T cells (46). Antibody responses to TNP and DNP-ficol are not reduced in IL-1RI–deficient mice (40), but Th2 isotypes are increased and IL-4 and IFNγ production by antigen-stimulated lymph node cells is consistent with enhanced Th2 and reduced Th1 responses (41). In the current study, IL-1RI–deficient mice showed significant impairment of humoral immune responses to sheep globulin. As these responses were intact in mice with IL-1β deficiency, this suggests that IL-1α–mediated effects play an important role in humoral immune responses to sheep globulin administered intravenously without adjuvant. The lack of additional protection from the development of crescents or glomerular recruitment of CD4+ T cells and macrophages in IL-1RI–deficient mice compared with IL-1β–deficient mice suggests that IL-1α does not contribute to these DTH-like features of crescentic GN in this model. Urinary nitric oxide, a product of activated glomerular macrophages was also similar in IL-1RI- and IL-1β–deficient mice. IL-1α–deficient mice have been shown to have reduced contact hypersensitivity to TCNB and reduced T cell proliferation to this hapten, which appears to be due to deficient dermal cell priming of T cells in the absence of IL-1α (43). IL-1RI–deficient mice also show reduced cutaneous DTH (28); in the current study, cutaneous DTH to sheep globulin was reduced in IL-1RI–deficient mice. This is consistent with an important role for IL-1α production by dermal cells in antigen presentation to T cells in the skin, which is not required for glomerular DTH. Previous studies have not addressed the separate contributions of IL-1α and IL-1β to crescentic GN. Administration of human recombinant IL-1ra, which blocks the IL-1RI and thus inhibits effects of both IL-1α and IL-1β, ameliorated crescentic anti-GBM-induced GN in rats (47). This treatment was associated with development of antibodies to the administered IL-1ra but did not reduce the circulating titers of antibody to the nephritogenic antigen. IL-1ra treatment can also prevent progression of established crescentic anti-GBM GN in rats (48). The roles of IL-1α and β in LPS-augmented acute heterologous phase anti-GBM GN in rats have been explored using polyclonal anti-IL-1β and anti-IL-1α antibodies. This study demonstrated IL-1β–dependent and IL-1α–independent glomerular neutrophil recruitment and proteinuria (26). IL-1ra has also been demonstrated to attenuate proteinuria and renal expression of ICAM-1 in heterologous phase anti-GBM antibody–induced injury (24). The current study reveals significant but separate roles for both IL-1α and IL-1β in a murine model of crescentic GN. They demonstrate an important contribution of IL-1β to recruitment of cellular effectors in glomeruli and to the development of crescents, but not to the development of humoral effector mechanisms of glomerular injury. The additional protection from glomerular injury observed in IL-1RI–deficient mice indicates that humoral immune responses to the nephritogenic antigen are reduced in the absence of IL-1α as well as IL-1β signaling. This results in reduction of the glomerular deposition of autologous Ig and complement, which would attenuate the minor humoral component of injury in this model. This suggests that IL-1α plays its dominant role by modulating the systemic immune response rather than acting as a local (intrarenal) mediator of injury in anti-GBM GN. These studies were funded by a program grant from the National Health and Medical Research Council of Australia (NH&MRC). A/Prof Tipping is an NH&MRC Principal Research Fellow. The technical assistance of Ms. Alice Wright, Ms. Janelle Sharkey, and Ms. Christine Vaculik and the gift of the IL-1RI−/− mice from Dr. Abhay Satoskar are gratefully acknowledged.